Former Catalan President Carles Puigdemont called on Spain to abandon its attempts to prosecute separatist leaders as he left a German prison, urging Madrid to enter into dialogue with them. Former Catalan President Carles Puigdemont called on Spain to abandon its attempts to prosecute separatist leaders as he left a German prison on Friday, urging Madrid to enter into dialogue with them. 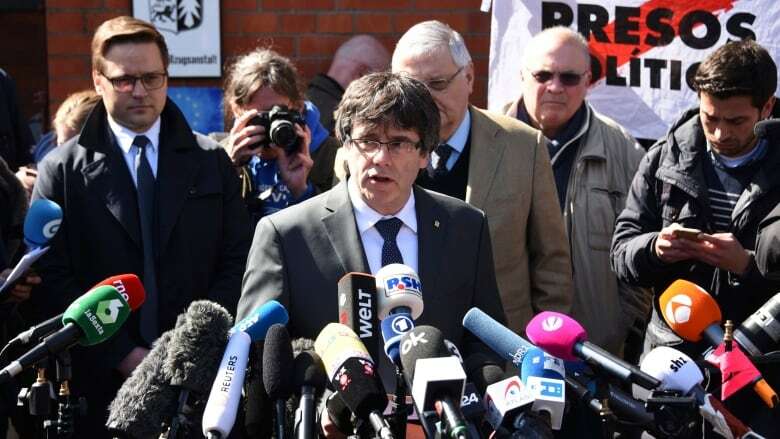 Puigdemont, granted bail after German judges ruled he could not be extradited on charges of "rebellion" brought by Spain, thanked prison staff as he emerged to cheers and people waving Catalan flags. He called for "the immediate release of all my colleagues in Spanish prisons." "It is a shame for Europe to have political prisoners," Puigdemont said. "Finally the time for dialogue has arrived." Judges on Thursday rejected Spain's request to have him extradited to face the rebellion charges for having organised a referendum on Catalan independence that Madrid viewed as illegitimate. They set bail at 75,000 euros ($117,000), saying that Puigdemont, who fled Spain five months ago after Spanish Prime Minister Mariano Rajoy dismissed his regional administration, did not pose a serious flight risk. Puigdemont's German lawyer, Wolfgang Schomburg, said he would continue the legal battle to have judges also rule out his extradition on a lesser charge of embezzlement of public money. Since Spain has said it will respect the German court's ruling, extradition from Germany on the lesser charge would effectively grant Puigdemont immunity from the rebellion charges, which can bring up to 25 years in prison. But a return to Spain under any other circumstances might not do so. Earlier, the German Foreign Ministry urged Catalan lawmakers to form a new regional government as soon as possible, saying this was a precondition for making progress on a political settlement to the stand-off with Madrid.